The brisket was as tender as flan. Fill in the blank: The Bay Area is missing a _____ food scene. Troll the food-nerd message boards and you'll find graduate-level observations on the lack of Belgian food ("I dream of tomate crevette with real North Sea shrimp"), East LA-style Mexican seafood, and Taiwanese sit-down delis. But any grade-school gourmet can tell you that the Bay Area's most glaring culinary omission is a robust barbecue scene. Enter Tanya Holland, well-armed with a smoker, a smile, and a surplus of true grit. With her husband Phil Surkis, Holland repurposed the old Yardie Jerk space on San Pablo Avenue late last year, giving it a cowboy-themed patina — well-suited for her mission as a West Oakland trailblazer. It's an isolated spot, though not too far from the nouveau soul restaurant that earned Holland the East Bay's uncomplicated, all-consuming love: Brown Sugar Kitchen. Like Brown Sugar, B-Side BBQ fills a specific culinary dearth, in a neighborhood that has had very few dining options at all. In that capacity — adding a fresh face to the barbecue landscape, and to an isolated stretch of San Pablo Avenue — it succeeds. 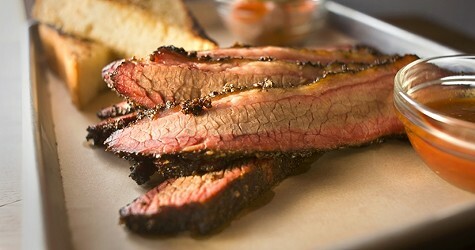 Will it keep haters from bemoaning the lack of decent local brisket and ribs? Is it a revelatory approach, changing the barbecue paradigm for years to come? No, but B-Side BBQ is pretty darn good. Holland has no barbecue-specific stints on her résumé, and for all her culinary globetrotting, she has never been in smoking distance of Kansas City, Memphis, or the hill country of Texas. Still, she's a dab hand in the kitchen, and a quick study. At Brown Sugar Kitchen, she melds down-home soul food with her classical French training; a Cal-cuisine emphasis on well-sourced ingredients; and lessons picked up in the haute kitchens of Cape Cod, Boston, and New York. She takes the same polymath approach to her smoked meats at B-Side, and the results are largely positive. 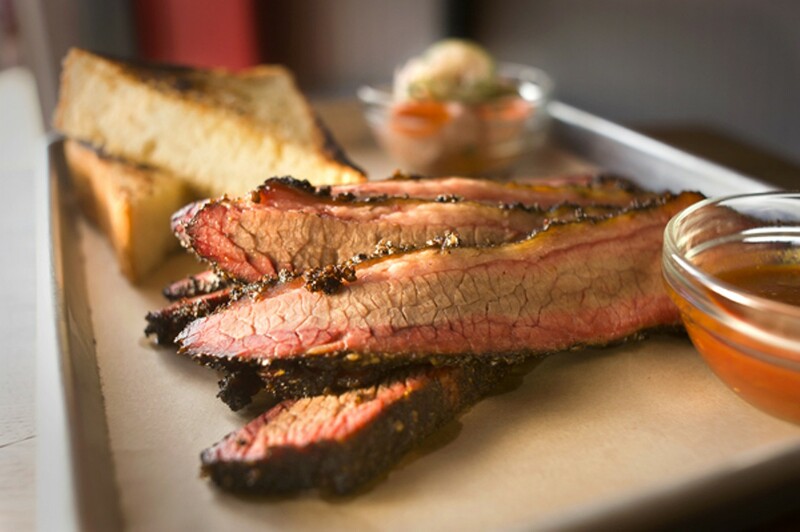 Smoked brisket is a frequent barometer of a barbecue joint's skills, and B-Side does not disappoint. Holland makes smart choices from the start, selecting supple cuts with fat streaks that are soft and melt away on the tongue. There was no unpleasant gristle, and my fork cut through the meat like it was flan. The brisket's deep beef flavor was boosted — but not overpowered — by a light sugar-and-spice rub, and Holland brightly excused herself from the sauce/no-sauce debate with a small dish of barbecue sauce on the side: your choice. The edge also bore a nice crust and the thin pink smoke ring was pretty as a picture. Holland's fried chicken (and waffles, natch) anchors the menu at Brown Sugar Kitchen, and other worthy items seem to circle in its orbit. The smoked barbecue chicken at B-Side, juicy and lush and expansive with flavor, may not gain this level of cult following, but it's a contender. The baked spicy wings were also on point, with the sizzling skin bearing a crisp, dark-and-tan mottle. These medium-hot numbers begged for a cool dunk in the accompanying smoked blue-cheese dip. By contrast, B-Side's ribs, another vital building block of any barbecue chef's portfolio, were just okay. The lightly spiced baby backs were spare on the meat, and gave a little too much resistance to extraction from the bone. The Dark and Stormy St. Louis ribs had a fantastic flavor profile, a combo of stout beer and fresh ginger, but again were less tender than you'd hope for. Besides a "spicy slaw" that was curiously flat, B-Side's excellent sides elevated any main dishes that weren't up to snuff. Standard with all orders was a couple pieces of thick grilled Acme pain de mie, toothsome as any Texas toast. You also get bright little dishes of pickled cauliflower, carrots, radish, jalapeño, and onion, a perfect palate-cleanser between the meat. Baked mac 'n' cheese, made with cheddar and a rich béchamel and bread-crumb topping, hewed near to classic. The cornbread was outstanding — moist and spongy with a pat of honey butter cascading over the edges. And even the collard greens, cooked simply with a bit of garlic, achieved a commendable chew. Overall, B-Side BBQ wasn't one of those rare, transformative smoked meat experiences I've had at Double D BBQ in Grand Lake or Hill Country in Manhattan. But it was really, really good. Beyond the food, it's a welcoming, well-designed spot to hunker down (cowboy talk) for a meal. By now you've probably heard that Holland and Surkis commissioned a local artist to superimpose their pictures into old black-and-white frontier photos on the walls. Loopy cowpoke branding has been burned into the wooden tables. Old black cowboy movies play silently on a couple of corner screens. Overhead rafters have an old barn's red-and-white color scheme. The well-curated soundtrack ranges from Nina Simone to Coltrane to Digable Planets. Many people who come in for takeout end up sticking around. Holland has been slowly increasing the hours, bumping closing time from 4 to 6, and she hopes to be open at night by summer. It remains to be seen if her target audience will venture to B-Side after dark (Brown Sugar is daytime only) but it's a studied risk. I'll certainly be there. Smoky J's Q House joins Bay Area revival.